In 1922 Guy Noble, director, National Committee on Boys and Girls Club Work, and Bernice Carter Davis, educational director of the Hazel-Atlas Glass Company, arranged a trip to France for the national champion canners of the United States, the expenses of the trip to be donated by the American Committee for Devastated France, a committee headed by Anne Morgan, sister of J. Pierpont Morgan. Five sectional contests were set up, and the first and second place winning teams in each section were to compete at the International Live Stock Exposition as part of the 1922 National 4-H Congress. Out of the 10 finalists, the first and second place teams would be sent to France. The nationwide canning demonstration contest was held in the old International building at the end of the cattle barn. Only a board partition separated the demonstrators from the cattle. Despite their surroundings, the contestants, dressed in plain cotton uniforms, worked skillfully at tables, canning one fruit by either hot water or steam bath, and one vegetable by either hot water or steam pressure. The roving public, strolling past this spectacle of intent industry, noting the array of foods, kettles, and cookers, could hardly have suspected that this was a part of a nationwide system of practical education. To them, it must have seemed to be an advertising stunt. But the girls were eager to compete for the prize – a two months’ trip to Europe. 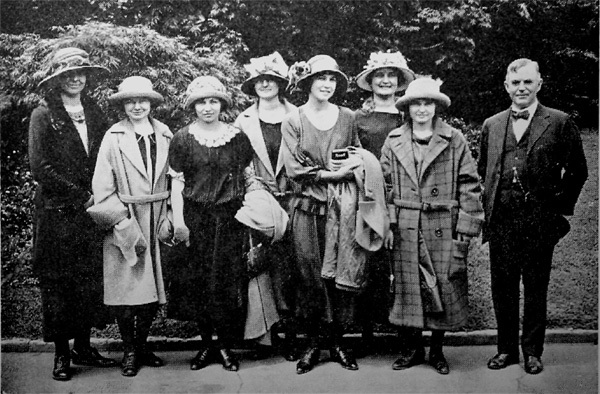 The winning Iowa and Colorado teams toured France in June and July, 1923, giving demonstrations of their skills, attending French schools of home economics, and sightseeing. Their trip, which was highly publicized, did much to interest Europe in the new kind of youth Extension education being conducted in the United States. Bound for Europe! In 1923, the Iowa and Colorado canning teams won trips to Europe. Pictured with the group and their chaperones is Secretary of Agriculture Henry C. Wallace. This photograph appeared on page 183 of “The 4-H Story” by Franklin Reck. This entry was posted in History and tagged Canning Girls Head for France by Larry Krug. Bookmark the permalink.